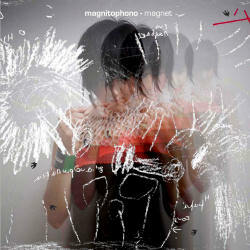 Magnitophono is an experimental project by Eleni Adamopoulou, a classical trained musician from Athens in Greece. On her new EP Magnet, she is offering five tracks that display her special blend of cuteness mixed with a certain sense of impending claustrophobia. You wouldn’t think so after the opener Pet which is a sweet percussive chimes driven melody using different delay effects in a very effective way. The following Ninjeto shows her from her more schizophrenic side. The chiming synthesizers meet this time abrasive beats that stay discreetly in the background, thus creating an atmosphere of unease. The middle piece Little Boy Blue is the EP’s longest track with a little over five minutes, and comes with moody electronic piano lines, erratic beats and hushed vocals. The final two tracks Down To Earth and To Yourself more or less continue in that vein, juxtaposing reverb-heavy synth notes with ethereal, not always fully melodic vocals, to underline the fragility of it all. Ms Adamopoulou definitely knows how to use her array of effects and always achieves estrangement when you’d least expect it. That certainly doesn’t make her songs catchy, but they do retain that grain of charming innocence that listening to Magnet is anything but a strenuous chore. Just do never forget that we are in the presence of an accomplished artist who probably always has an ulterior motive, even if it’s not obvious to the casual listener. Nevertheless Magnet is a pleasant little EP that should warm the hearts of the experimentally minded music lover.